Alternative farming enterprises and especially those that fit into small scale farms and homesteads are gaining lots of interest lately. Raising quail is one such enterprise that is becoming more and more popular. And there is a good reason for their popularity. Quail are highly efficient producers – using very little resources and producing meat and eggs that have a highly-priced and high-demand market. 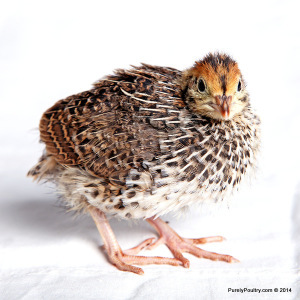 There are lots of different species of quail, but Coturnix Quail are probably the most highly productive quail. Coturnix can reach lay-egging maturity at 6-7 weeks of age. The eggs are small, but speckled and pretty, and in high demand. Coturnix can reach adult weight at 7-9 weeks. This makes for a quick turn around, with very little opportunity for issues to arise. This quick time period also makes the decision to try raising quail an easy one as there is not a huge commitment needed. Although most varieties of Coturnix only reach 6 ounces in weight at the most, a relatively new variety called the Jumbo Coturnix have been reported to reach a full pound in weight. Quail meat is a delicacy and is very much sought after by chefs and foodies. It is understood by the consumer that quail are small and expensive. Coturnix are also easy to breed. They are fertile at an early age and with their prolific egg laying, you can easily replenish your stock several times throughout the year. They will lose some fertility as they age so be sure always to keep young, less than a year old, breeding stock. 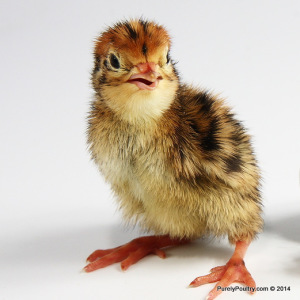 Coturnix Quail are quite simple and straightforward to care for. They are quite winter hardy, although they do require some sort of shelter to keep them out of the wind and rain. They also take up very little space. Plan on about 1 square foot of space per adult bird. Quail can be kept in chicken-tractor style enclosures on the ground or in hutches with wire floors. Keep in mind that quail fly very well and will fly away, especially if startled. The other main thing to keep in mind is that they don’t do well in wet or soggy conditions. They tend to have higher ammonia levels than chickens in their excrement and a major rule in good quail husbandry is keeping a dry, clean floor under the birds. Coturnix do not perch or roost; they sleep and nest on the floor or ground, so that’s another reason why dry floor conditions are a must. Pine shavings are fine to use with Quail, but avoid using cedar shavings. Providing your Coturnix with a spot to take dust baths is also a solid good husbandry practice. Dusting is the primary way Coturnix keep themselves clean and pretty and parasite-free. Sand can make a nice dust bath material. Watch for fighting. With plenty of space, fighting is usually not an issue, but some individual birds can be troublemakers. Feather picking is the first sign that you have a troublemaker or not enough space in your enclosure. Coturnix Quail are generally calm and social birds. They are probably your best bet for a pet quail. They make lovely chirping, frog-like noises, and were originally bred in Japan centuries ago for their song. They do startle though – loud noises, sudden light changes, unfamiliar dogs and other animals can cause quite a raucous. So plan your enclosure for a spot where these startling influences would be at a minimum. Chicken tractors, rabbit hutches, and pigeon lofts can all be repurposed into quail housing. Roosts aren’t needed although branches and brush can be included to give your quail some hidden spots where they can feel secluded and safe. Some of my favorite quail housing has been the recycling of old furniture into “Quail Cupboards.” Old furniture can often be easily transformed into stylish quail housing. I recently saw a large breakfront, with chicken wire covering the front and quail nicely settled within the airy shelves. I have also seen fabulous quail enclosures set into patios and decks with living roofs covering the quail enclosure. The living roof was simply a box with a slightly tilted floor and gutter for drainage on the low end. The box is then filled with soil and anything from flowers to herbs to greens and veggies can be planted in it. Electric Spools can also make awesome quail housing. An entranceway can be cut into the center of the spool, and chicken wire can be applied to the outside of the spool. The spools can be piled or can be spread out with an enclosure built between them depending on how many birds you are housing. These various housing and enclosure choices provide a variety of opportune ways to easily integrate quail into almost any farm or homestead. If you look around and get creative, you’ll see that you can fit a quick and simple quail enterprise into all sorts of niches on your farm or homestead. And note that even in locations where chickens may be prohibited, quail are often perfectly legal. Quiet and undemanding quail also work very well in urban farm settings. They are a perfect extra product for rooftop urban farms to grow. 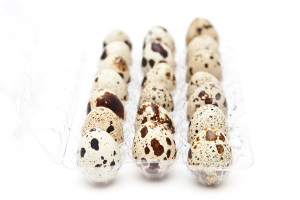 And you will be close to your market – urban chefs and foodies buy more quail eggs and meat than anyone else! I’m interested I have a small incubator and raised a few hens. so now I’d like to try quail. ← Washing and Refrigerating Eggs – is it necessary for your own eggs?